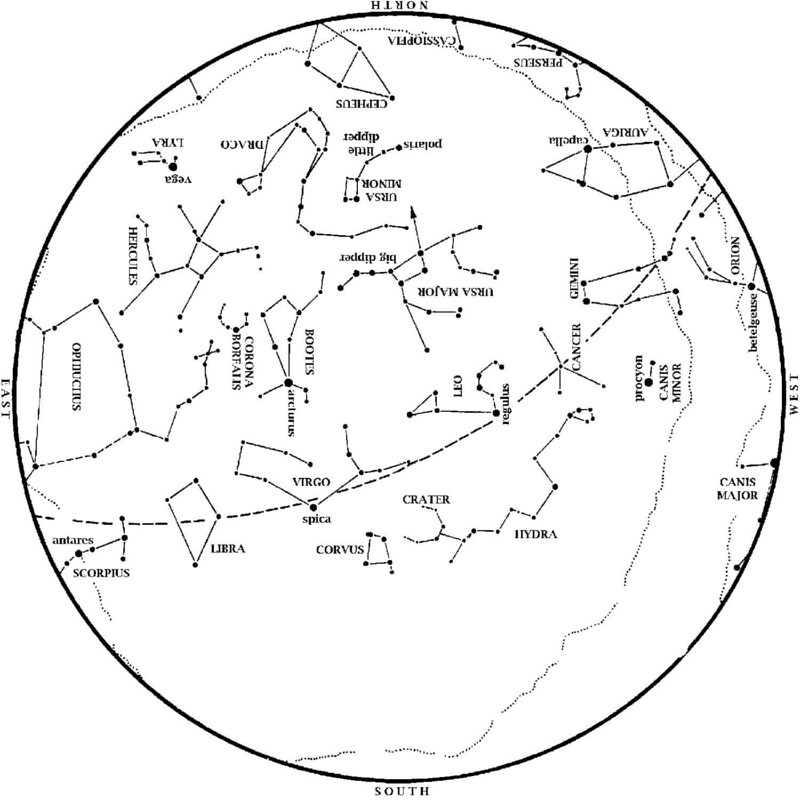 This star map shows the Houston sky at 10 pm CDT on May 1, 9 pm CDT on May 15, and dusk on May 31. To use the map, put the direction you are facing at the bottom. In May, you can watch as the Dog Days begin! We are in the Dog Days when the Dogs have vanished from the sky. As May begins, Orion, the Hunter is clearly visible due west right after sunset. To his left, aligned with Orion’s belt, is Sirius, the Dog Star, the brightest star we see at night. Forming a triangle with Sirius and Orion’s brightest star Betelgeuse is Procyon, the Little Dog Star. Throughout May, watch as Sirius appears slightly lower and lower to the horizon each night, until it is gone before May 31. By mid-June, Procyon is gone as well. When the Dogs are up only in the day, we’re in the Dog Days. Meanwhile, spring stars are high in the south and east. A distinct backwards question mark shape outlines the mane and forepaws of Leo, the Lion. Three stars forming a right triangle rise underneath; they mark Leo’s hindquarters. The Big Dipper is as high as it ever gets in the north at dusk. You can extend the curve of its handle to ‘arc to Arcturus’ and then ‘speed on to Spica’. These stars high in the east and southeast, respectively, by dusk tonight. As Orion and his dogs set, look for Antares, brightest star of Scorpius, the Scorpion, to rise in the southeast. At the same time, Vega, brightest star of the Summer Triangle, appears low in the northeast. These stars remind us that summer is on the way. On May evenings, the plane of the Milky Way roughly coincides with the horizon. (At Houston’s latitude, the two planes are off by less than three degrees). We are therefore looking straight out of the Milky Way plane when we look up early on a May evening. Thus May evening skies have fewer bright stars, as we see most of the brightest stars in the Milky Way plane which is ringing the horizon. 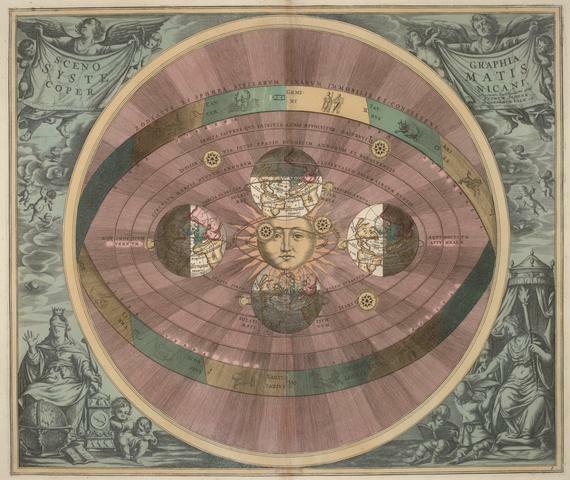 Heliocentric universe, Harmonia Macrocosmica, 1660. Artist: Andreas Cellarius (c. 1596 – 1665). Source: Wikimedia Commons. Venus is higher in the west at dusk this month than in April. Look for it low to the horizon, over the point of sunset. Venus outshines everything in the sky but the Sun and Moon, so you can look for it even in twilight. Venus remains the evening star all spring and summer. Jupiter is up literally all night long on May 8. Look for it low in the southeast by late twilight tonight. By the 31st, Jupiter is well placed for evening observing right as night falls. Mars continues to brighten each morning as it leaves Saturn behind. Face south at dawn to see it. Saturn is now in the southwest at dawn. Although significantly dimmer than Mars, Saturn outshines the stars near it, and is therefore just as easy to see. 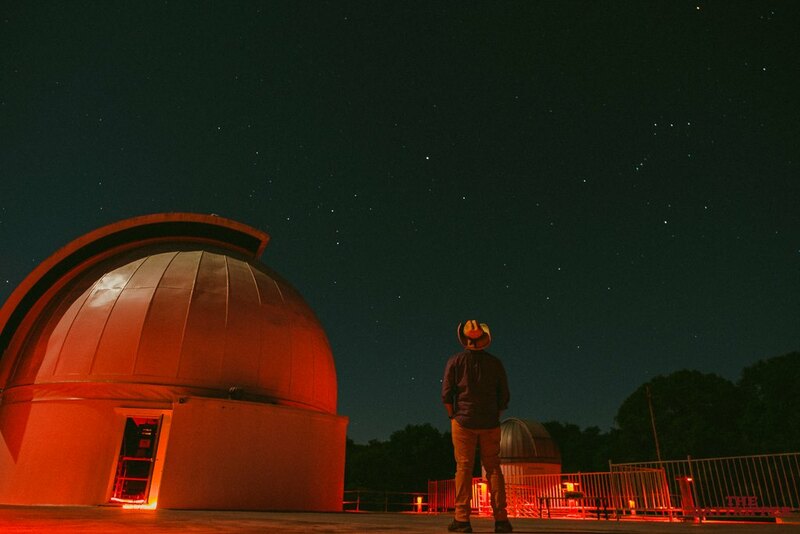 Last Quarter May 7, 9:09 p.m. New May 15, 6:48 a.m.
1st Quarter May 21, 10:49 p.m. Full May 29, 9:20 a.m.
George Observatory is open to the public once again! Come join us any clear Saturday night. 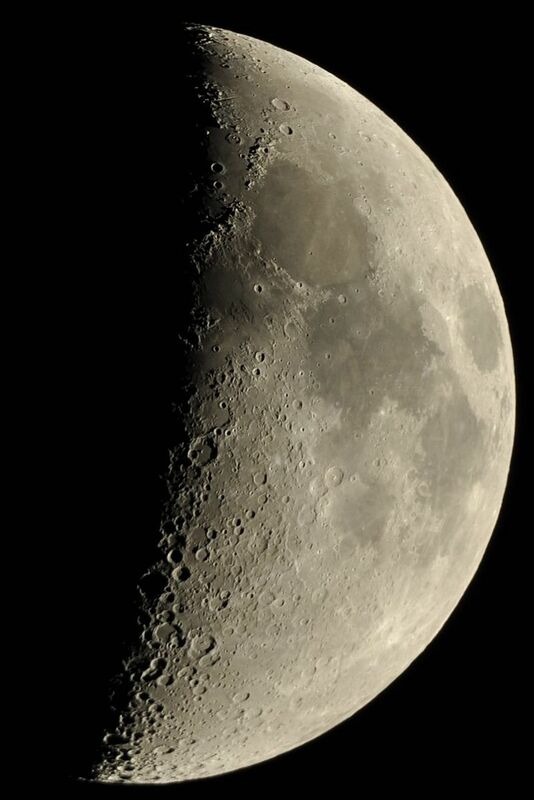 Would you like email updates on current events in the sky, at the planetarium, and at George Observatory? If so, send an email to astroinfo@hmns.org. Previous Post Bugs on Wheels has Gotten an Upgrade!